If you’re interested in the cultural matrices that make up US culture, you can’t avoid studying the country’s obsession with cars. Here’s my review of a well-written and thorough study by Cotton Seiler dealing with just that. Writers from Fitzgerald to Steinbeck to Kerouac, to Didion have focussed on road culture in one form or another. this book explores the process behind the practice. There is no knowing twentieth-century America without knowing why and how we took to the highways so damn much during that epoch. One sometimes wonders how it is that the car became a sacrament in the United States, far more than in any other country, and how driving became a major ritual for ceremonializing the doctrine of “freedom.” Considering how it increasingly results in both structured and circumstantial restriction of actions, of choices, of relationships–and even of the term of life itself through ills and injuries imposed by road crashes, pollution, stress, and driving’s inevitably sedentary nature–the phenomenon is undeniably a cause for puzzlement. Cotten Seiler presents a compelling case for one answer. 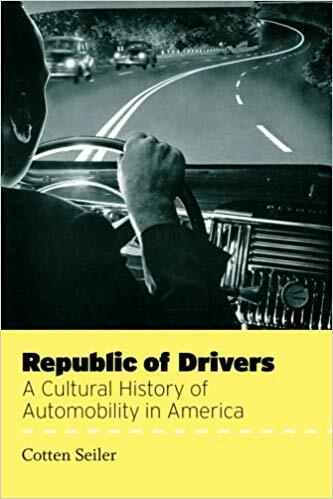 In Republic of Drivers, he examines how basically imaginary constructs of “freedom” were attached to and marketed with the car and car culture to compensate for the loss of control over their lives US workers suffered with the advent of industrialism. This was a time when “proprietary capitalism” (what we would now call entrepreneurialism, but was business as usual back when) was being replaced by “industrial capitalism,” where workers became drone-like employees rather than businesspeople in their own rights. He outlines how car culture and highways also became mechanisms for imposing strict control through the use of this freedom imagery in the US. As cars morphed from artisan-crafted indulgences of the wealthy to factory-made products destined for the middle and working classes, so did regulation and restriction of motorists. Some of this was reasonable, of course: cars are dangerous and take up lots of space for roadways and parking; the first attribute leads to licensing and police oversight, the second to taxation. But rather than merely accommodating the car, as Europe did, America redesigned itself almost entirely around the private use of automobiles, inventing new and often emotionally-devastating urban forms such as the bedroom suburb, the strip mall, and the superhighway. These destroyed community and isolated individuals–within their cars while on the move, and within neighborhoods that offered no public space not reserved for cars when at home. While these claims may seem far-fetched to many at first glance, Seiler supports them well with citations from not only academic studies but also news articles, popular literature, and even pro-car publications from throughout the period of automobility’s climb to complete dominance over our civic infrastructure. Seiler begins by examining the background to his thesis, the great change from artisanal to industrial manufacturing, as well as the later concentration of service providers and analytical workers into ever-larger hierarchical collectives such as insurance and banking corporations. He focusses much attention on “Taylorization,” that is, the spread of F. W. Taylor’s “scientific management” principles, which saw employees as mechanistic elements of a workflow, and the wrenching psychic effect this had on the flesh-and-blood persons so employed. He follows in rough parallel with a synopsis of the history of American individualism, especially in the 19th century, and the conflicts that US culture’s particular emphasis on self-reliance and personal freedom engendered as corporate regimentation became the norm. A telling quote from Peter J. Ling notes that driving “adjusted individuals to the strains of modern life while tying the people concerned more tightly to the social order”–in this case a social order imposed from the top down, rather than evolved organically within a community. Limited-access (which also means limited-egress) highways, government ID, limitation of choices in travel and transport, restriction to the confines of road networks for local travel, high tax obligations, a complex regime of coercive signs backed up by armed authority, and the obliteration of public spaces where one could engage in unmediated discourse with one’s fellows, were all offset by the carefully-nurtured delusion that the automobile’s driver took on the very power of the car, and that, instead of having become nothing more than an upaid chauffeur, he (or she) was a master of space and time. Separate chapters deal with motoring and feminism and motoring and the Black community. In the first of these Seiler examines how the control of an automobile was seen as an essentially masculine function and so promoted, even by entities such as insurance companies whose statistical tables showed them that women were as a group better drivers than men. He argues effectively that the freedom and power imageries attached to motoring were carefully crafted to de-emasculate men who, as a class, had lost control of their lives as a result of the shift to corporate employment. In the second, he explores numerous Black-edited driving publications to show how, for African-Americans, stepping into a car, despite all its restrictions, meant stepping away away from Jim Crow, since, as long as Blacks stayed in the car, they were not seen as individuals, and were therefore not persons subject to racism. The guides, however, largely comprised lists of gas stations, hotels, and diners where Blacks could feel safe to step out of the car as eventually becomes necessary. Automobility and car culture has had the effect of breaking the bonds of community typical of pre-car neighborhoods, where residents exchanged information among themselves, and replaced them with unidirectional relationships wherein large media corporations provided information to citizens through the car radio and the living-room television. Meanwhile, as freeways crushed and separated neighborhoods, drivers themselves were inreasingly confined to sheeplike herds on those same superhighways, next to yet intractably isolated from their fellows, lurching in regimented arrays along the channels of lanes and offramps, repeatedly passing along or under signs instructing them on where and how to drive. The combination of powerful structures of social control with elaborate constructs of self-mastery laid over them as an ideological armor is indeed an empowering force–though not for drivers. However, as in classic fascism, the delusion is the payoff for membership, while freedom is the price. This may explain why driving became, for a long time, something of a compulsory national religion, and why, now that dissident sects are springing up in the New Urbanism, the Carfree Cities movement, and the growth of urban cycling, reactionaries, including many drivers themselves, are intensifying their expressions of hostility to, for example, the real freedom, self-reliance, and self-empowerment bicycles provide. It is ironic that even as champions of conservatism deride public transit and urban villages as “socialistic,” they promote nearly compulsory membership in rigid collectives known as “corporations,” and furthermore actively discourage informal public gatherings of free citizens, through the arrogation of all common space to persons sequestered in motorcars–and through the promotion of single-family suburbs, where each family lives in isolation from its neighbors. Seiler carefully and systematically examines how this came about; in doing so, he may help us craft strategies to free obsessive drivers from their thralldom to the car, and make the car but one choice of many for travel and transport in a healthy, self-reliant, and fundamentally more honest urban culture. First published in Sustainable City News.